Bretz (1956:192) reported the tradition (legend?) 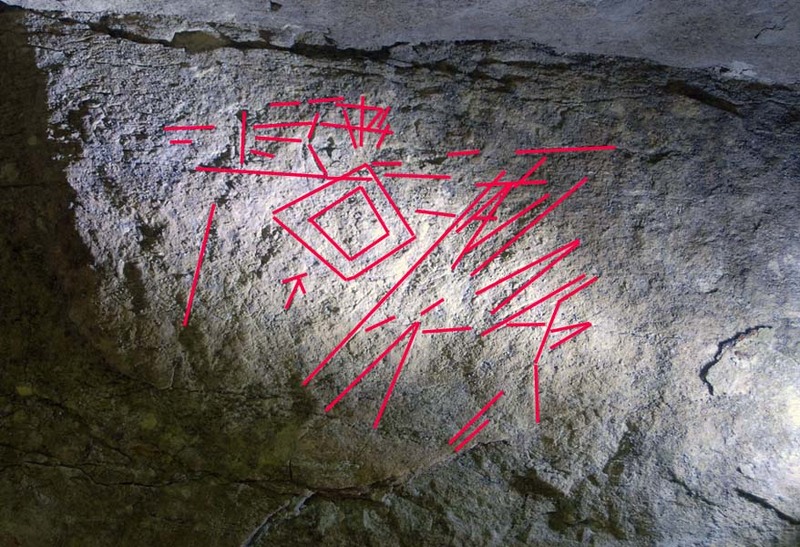 that pictographs decorated the walls of the cave, but had faded away by the time of his book. The site is situated on private property and is not open to the public. No artifacts or debritage was observed at the site. 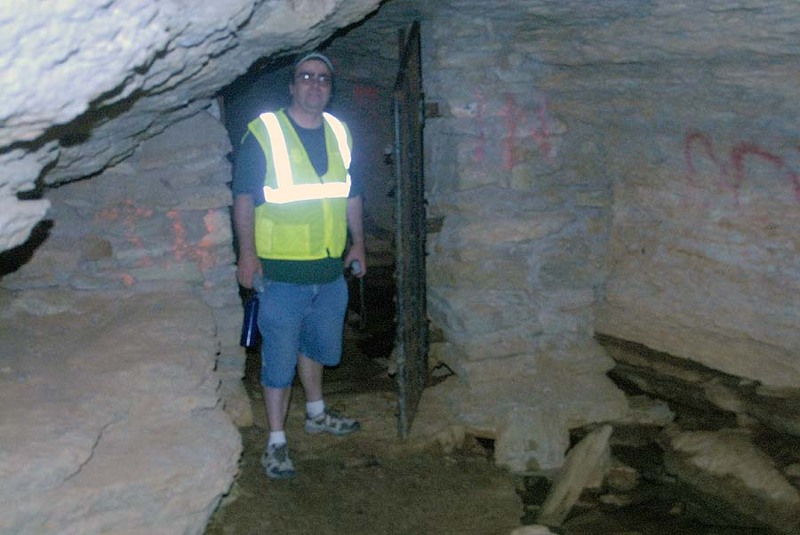 Entrance to Spanish Cave; Eric Fuller seated near the one surviving petroglyph panel. 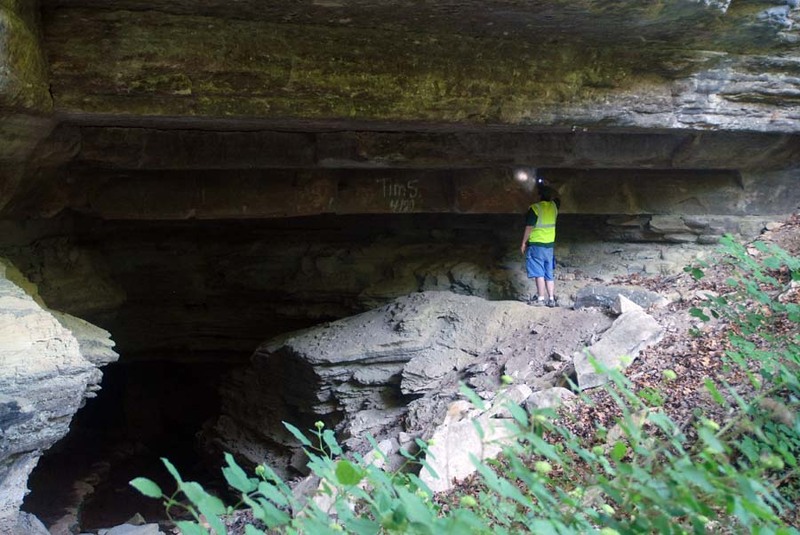 All surfaces near the entrance were searched for both pictographs and petroglyphs by Michael and Eric Fuller. 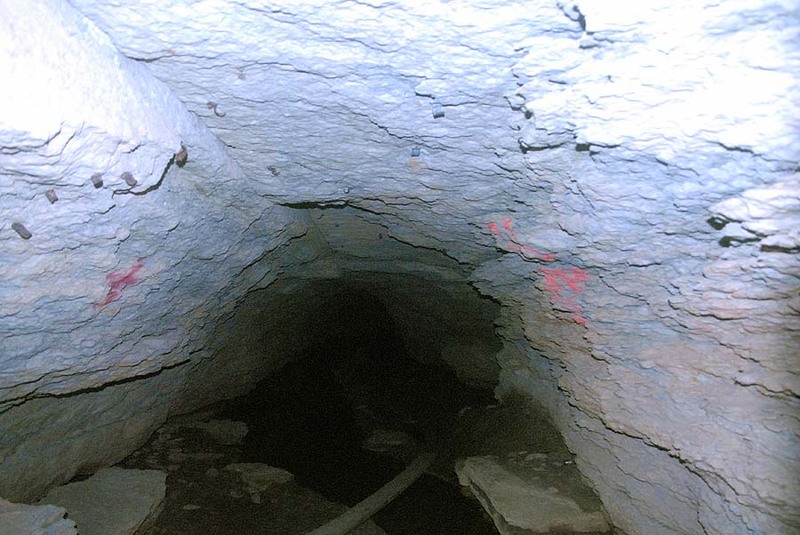 The entrance area of the cave was carefully examined with permission of the caretaker. 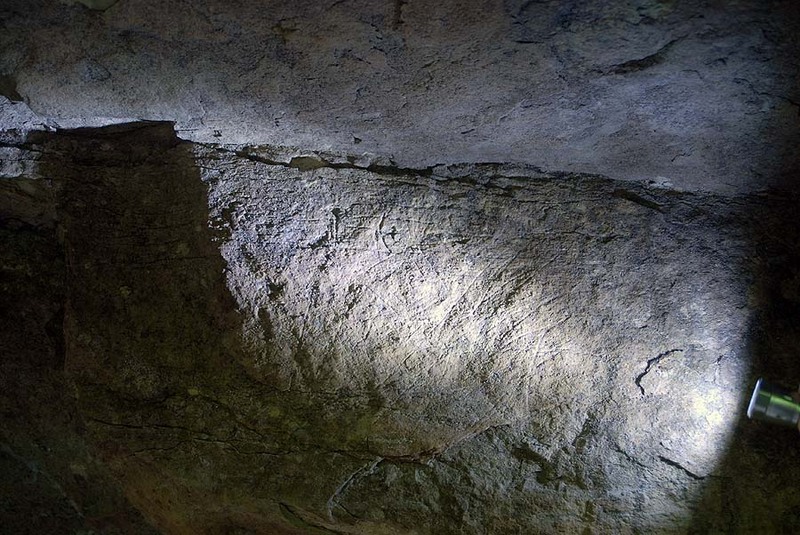 Eric Fuller shines a light on the one panel of very fine line petroglyphs. The caretaker to the cave was a guide during the 1960s; his guide-story was that the pictographs were on the left hand wall of the entrance. Photograph of the petroglyph panel in raking light. The absence of names or initials makes it likely that these are prehistoric. The designs are scratched into a vertical exposure of bedrock that measures 110 cm across the top. Fine line petroglyphs outlined using photoshop. The diamond pattern is a Native American design used by the Osage tribe. The diamond pattern measures approximately 10 cm from tip to tip. 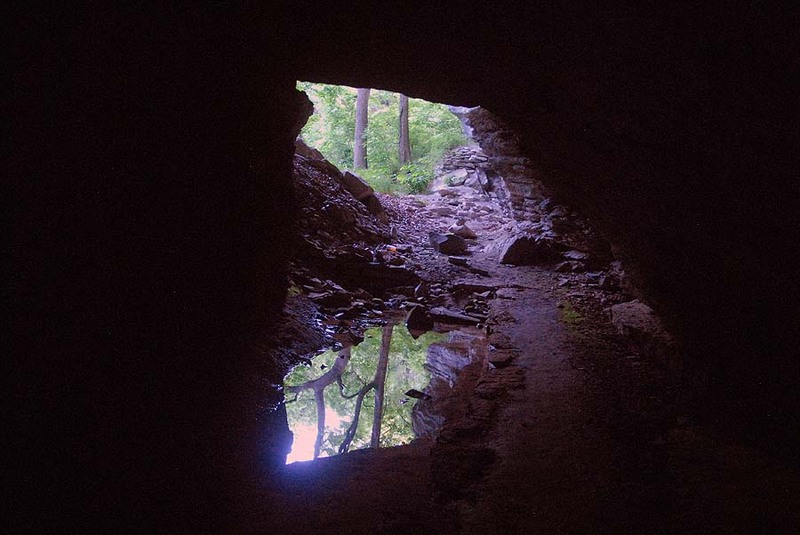 View from the gated entrance of the cave looking outward. Photograph of the passageway beyond the gate. 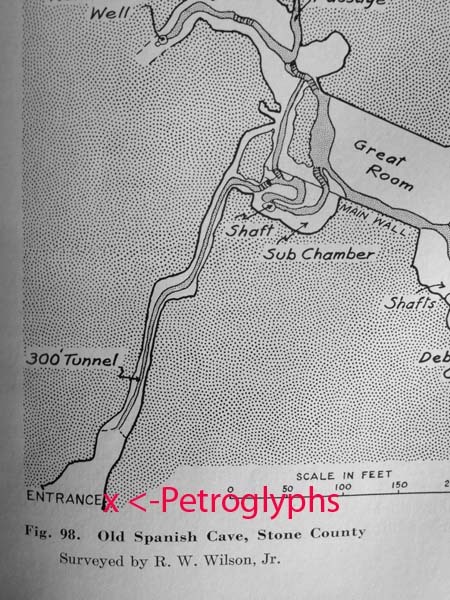 Location of the fine line petroglyph panel on the Old Spanish Cave map published by Bretz (1956:Figure 98). This site is briefly discussed by Carol Diaz-Granados (1993:489) and Diaz-Granados and Duncan (2000:Table 4.1). 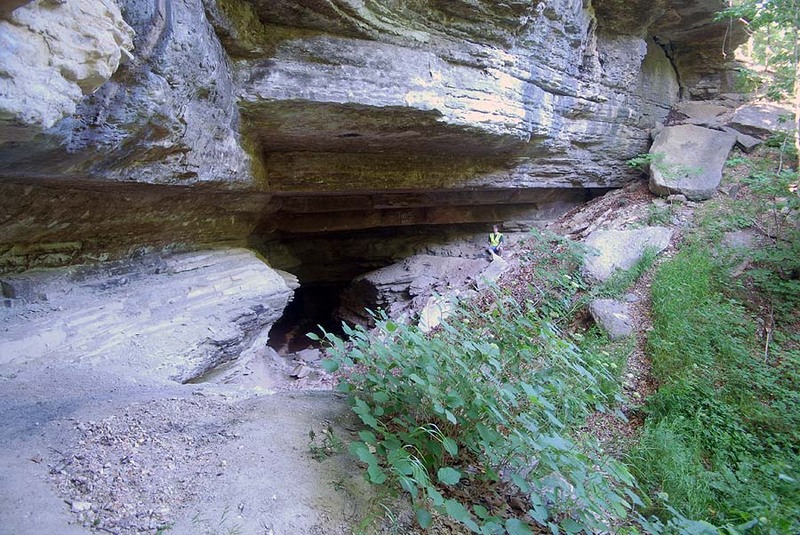 1956 Caves of Missouri. Geological Survey and Water Resoures Department, Rolla (Missouri.